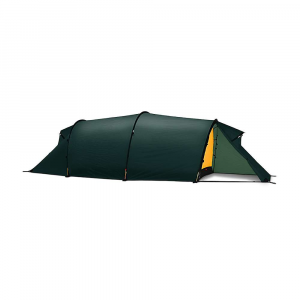 This tent is every bit as waterproof and breathable as advertised, very strong also. My other 4-season tent weighs seven pounds and is made for three people, so when I got serious about alpine climbing I wanted something lighter and faster. The Direkt had such good reviews and only weighs a tad over two pounds, so I figured I couldn't go wrong. This tent is about as heavy as two bivy bags, so why not use it instead of one of those horrible things? 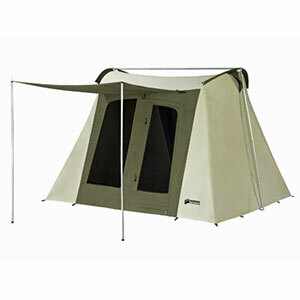 The Direkt is a simple two-pole dome, which most people can figure out without much difficulty. Don't wait till you are in a freezing gale to try it for the first time, but it's still not difficult. 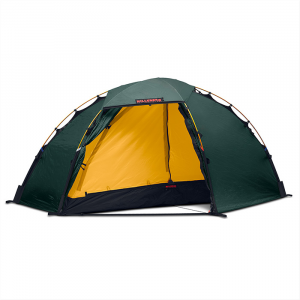 The tent is designed to set up from the inside so you can do it in bad weather alone. This does work pretty well though I felt like I was going to break the poles on a couple of occasions (I didn't). There are numerous guy lines and loops to stake the tent out to resist wind and I have not had a windy trip yet to evaluate their effectiveness but there seems to be plenty of options. The stakes that come with this tent are small, weak and there are not enough of them. I bought some additional ones to go with the tent so I could guy it out. This is an alpine tent and not a luxury basecamp cabin. There is room for two dudes to sleep inside without touching as long as they are head to foot and thats it. There is a gear bag in the peak that can hold a cell phone and not much more. There is no vestibule since it's a single wall tent and your pack belongs under your legs while you sleep like a good alpinist. This is shelter, that's it. Practice setting it up is important, just like EVERY tent. 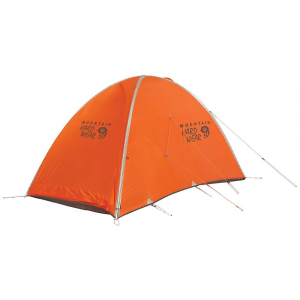 This tent packs down to about the size of a loaf of bread (the good bread, not Wonderbread) and the stakes and poles can go wherever in your pack. It's smaller than your down sleeping bag when packed. 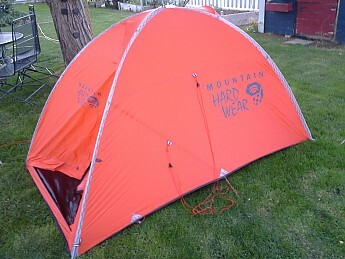 This tent is SUPER lightweight but has shown me no signs of wear this year even though I am kind of a brute with it. It's everything you'd expect in a 4-season Mountain Hardwear tent; tough and reliable. The claim to fame of this tent is that it is single wall, AND waterproof AND breathable. It TRULY IS!! The BD Firstlight, the former favorite of alpinists was light but not waterproof. MH claims that their proprietary membrane is WP and breathable. 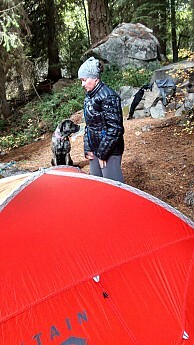 After spending a night in torrential rain in the Cascades I can vouch for this with this tent. Of course I also tested it in the yard under the sprinkler to check it before I took it on its maiden voyage. I have not seam sealed this tent. I'm one of those goofballs who thinks that a $400 freakin' dollar tent should have that already done. Weird huh? Sort of. There is a peak vent that kind of helps keep the tent aired out but, after an evening with the girlfriend in the tent with me during a downpour while we, were, well, active, the inside of the tent was definitely damp but not dripping. Opening the top of the door helped some but let in a little rain. There is a vent near the bottom of the door which I found to be useless. Also, this is an alpine tent, meant to be used in the winter or above the treeline so the door has no bug netting. If you are using it in a buggy place YOU ARE DOING IT WRONG. THIS is where this tent belongs; Camp Muir, Mount Rainier, August 2014. 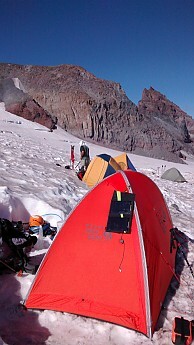 I have used this tent on the snow on Rainier, at 10,000 feet and in the severe rain at 4,000 feet. 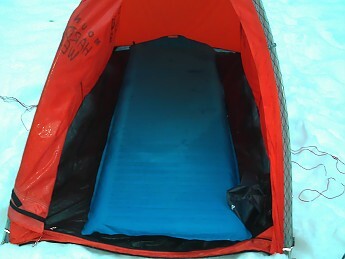 I will NEVER use it in the summer or at low elevations where it's not designed to be used. 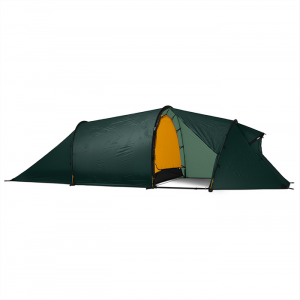 I have not tested this tent in the wind or under a snow load YET but it is very taut when pitched, has steep sides and has a small profile so it has great promise. 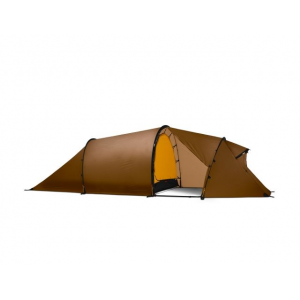 Who should buy this tent? "I don't want to use a bivy bag and I don't want a heavy tent." <<<--- that guy needs this tent. Anyone wanting to go fast and light in the alpine country and doesn't want to get wet if the weather turns crappy should definitely look into the Direkt 2. 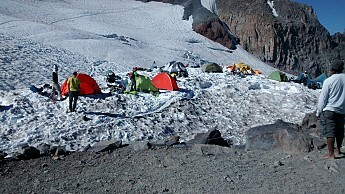 Three other Direkt 2 tents at Camp Muir. 04/2016: Mt Baker, torrential downpour! I was dry inside! The Mountain Hardwear Direkt 2 is not available from the stores we monitor. It was last seen January 16, 2018	at REI.